Global health experts are urging the Trump administration to allow U.S. government disease specialists — “some of the world’s most experienced” — to return to northeastern Congo to help fight the second-largest Ebola outbreak in history. The U.S. experts have been sidelined for weeks, ordered away from the region because of State Department security concerns. Two top medical journals this week have published commentaries calling on the U.S. to change its mind and send them back where they are sorely needed. This Ebola outbreak is like no other since health workers have compared the region to a war zone. Dozens of armed rebel groups are active, and their deadly attacks have forced responders to pause crucial Ebola containment work for days. Many new cases have been unrelated to known infections, alarming evidence that gaps in tracking the disease remain. Late Thursday, the World Health Organization declared this outbreak second only to the devastating West Africa one that killed more than 11,000 people from 2014 to 2016. Congo’s health ministry said the number of confirmed and probable Ebola cases has reached 426, edging past the Uganda outbreak in 2000. So far this outbreak has 198 confirmed deaths and 47 probable ones. It is not clear how many Centers for Disease Control and Prevention workers are now trying to tackle the outbreak from Congo’s capital, Kinshasa, which is nearly 1,000 miles away. A State Department official said that CDC experts — and those with the U.S. Agency for International Development, who are also affected by the order — are still working closely with international partners to stop the outbreak. There was no immediate comment from the CDC to the commentaries. The security concerns are real, Ebola responders say. Teams with the WHO and Congo’s health ministry venture out on virus containment missions accompanied by U.N. peacekeepers or other armed security in areas where gunfire echoes daily. Do you think the U.S. should send doctors to help fight the outbreak? Given the complications, this Ebola outbreak will last at least another six months before it can be contained, WHO emergencies chief Dr. Peter Salama has predicted. Despite the challenges, Ebola health workers have made breakthroughs that have given new hope in the fight against one of the world’s most notorious diseases. More than 37,000 people have received Ebola vaccinations and Congo has begun the first-ever trial to test the effectiveness and safety of four experimental Ebola drugs. 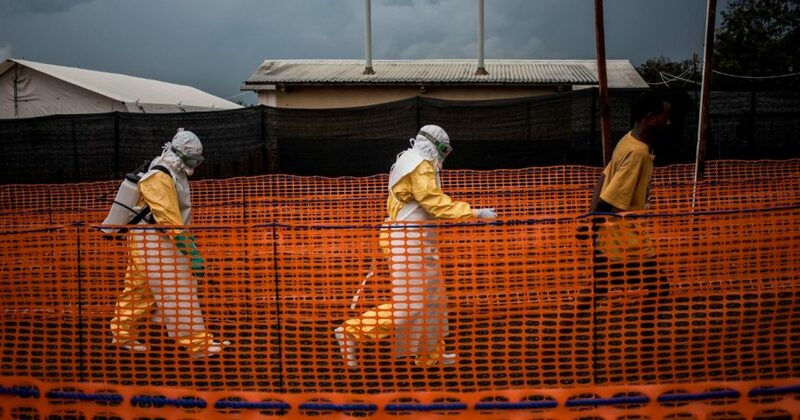 Speaking to The Associated Press on Friday from the outbreak zone, the Ebola response program director for the International Rescue Committee, Dr. Stacey Mearns, said the absence of the CDC’s experts can be felt acutely. Her colleague, Dr. Mesfin Teklu Tessema, the IRC’s senior health director, was among the more than two dozen people who signed the statement published in JAMA on Thursday. “If the (U.S.) ban were not in place, the CDC would have a big and growing presence here,” said Mearns, who worked closely with the CDC in West Africa’s Ebola outbreak. The U.S. sent thousands of responders to West Africa from the CDC and other government agencies, including the military. The CDC’s experts have rich experience in surveillance, treatment and lab testing, Mearns said, adding that some of that work is now being done from afar.